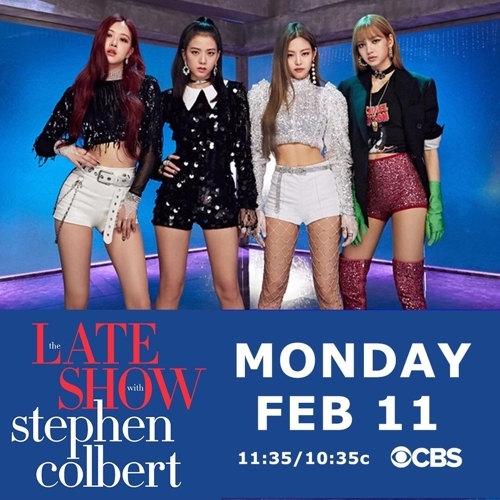 SEOUL, Feb. 7 (Yonhap) -- K-pop girl band BLACKPINK will take the stage on a late-night talk show hosted by U.S. comedian Stephen Colbert next week, the U.S. broadcaster CBS has said. Celebrities who have made appearances on "The Late Show with Stephen Colbert" include former U.S. Secretary of State Hillary Clinton, singer Lady Gaga, actor Ryan Reynolds, singer Justin Timberlake and actor Jack Black. The group will also make an appearance on U.S. broadcaster ABC's "Good Morning America" on Tuesday before debuting on "Strahan and Sara," an ABC program, on Feb. 15. YG Entertainment has teamed up with Interscope Record, which is affiliated with U.S. record label Universal Music Group, in a bid to help the K-pop quartet's foray into the U.S. market.